Davide Carbone runs the popular Production Masterclass at School of Synthesis mainly using Logic Pro X to demonstrate fundamental mixing and mastering techniques. Ableton Live users often ask him if the same mastering chain can be achieved effectively in Ableton Live. Here he discusses exactly how that’s done! Setting up an effective mastering chain in Ableton Live is maybe not as straightforward or effective as Logic Pro X. Many Ableton users in our Production Masterclass want to jump ship over to Logic Pro X after having spent time with it but Ableton does mastering pretty well. Now lets look at the each constituent plugin. Ideally you’ve been looking after your mix on each track as you go along. That would mean that you wouldn’t need to change overall level (pre-mastering chain) or imaging. If however you did, Utility would be the plugin to use. It allows DC offset removal, stereo image and gain adjustments. Again, hopefully you’ve been attenuating unwanted frequencies as you go so you can be gentle here. Slight shelving, low and high cuts would be best performed here using EQ Eight. In this example I have a steep low cut to remove anything under 35 Hz. You’re speakers won’t go down that low so unless you feel your music is going to be played on a state of the art concert rig it’s a safe and sensible cut. I’ve also added a couple of dB around the area of the kick drum to give the overall mix some punch and removed some ‘muddy’ frequencies around 430 Hz. Finally a gentle boost above 5kHz to give the mix some ‘air and sheen’. This is another plugin we could omit in the mastering chain as hopefully we have addressed transient peaks on individual tracks. I’m not a fan of digital compression on a mastering chain but if it has to be done then I’d recommend very gentle gain reduction of no more than 5dB. The Makeup here is quite useful to makeup the lost gain but also as a volume control going in to the important Multiband Compression. Here’s a plugin I only use on a mastering chain. EQ and compression is enough for the individual tracks but for adjusting each band of EQ, Multiband Compression is a valuable mastering tool. On the left hand side you have the bands. I have chosen to split them at 95Hz and 1.47kHz. So I have bass, mid and high control. Now I can compress each band individually. The next most important parameters are the T, B and A icons on the bottom right hand corner. T is for time (attack and release) of each compressor, B is for below which would offer us downward compression which I wouldn’t use here. A is for above and this is the important one, effectively allowing us to set the threshold and the ratio of each band compressor. The distance between the two dots and the red horizontal volume LED is the amount of gain reduction you have applies to each band. To the right of each band is the output, which allows you to adjust the final volume of each band. The settings you see here are gentle and quite generic. Try them on your mix! Gently does it! Here we should only be trying to prevent the mix from clipping. If you are driving your mix to hard in to the limiter then you are going to lose dynamic range and make your mix sound ‘hot’ which in mastering terms is not a good thing. If you are too loud going in to the limiter then retrace your steps. 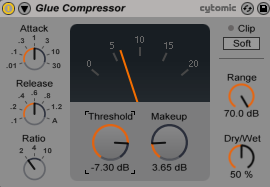 You have the flexibility of gain control in your Glue Compressor and Multiband Compressor so use it! The Limiter should only be limiting by a few dB. Also this is a great chance to set the overall Ceiling. Don’t leave it at 0.00 – that’s asking for potential trouble! Reduce it to -0.30dB, which is not audible but much safer. Happy mastering in Ableton Live! Compression. In my experience it's probably the most misunderstood dynamic effect in music production. What is it for and how do you use it? I'm going to explain the basics but I'd also like to explain compression in practice rather than just in theory.